Expecting a noise-fest? Well, yes and no, firstly this album contains one long piece of improvised music, recorded live at the Copenhagen Jazzhouse in May 2013, which has naturally occurring contrasting sections that not only give the overall piece real shape and structure, but also create an emotional depth. Although completely free flowing, this involves a gradual switching, which is done with great execution, between the intense and loud opening maelstrom textures to much more reflective & sensual sounds and then back again. Whilst listening to this piece, which lasts just over the half-hour mark, I found it almost impossible not to compare Yoshihide’s playing to that of his mentor, the late and great Masayuki Takayanagi, with the music at times sounding like an essay based on some of his albums such as Kaitai Teki Kohkan or April is the Cruellest Month. Paal Nilsson-Love busies himself carrying the energy of the music on a wave of batterie-induced momentum, such as Krautrock legends Ash Ra Tempel did on their debut album. There is great involvement in the music from the drummer and pounding beats gradually develop into skittish rhythms with such ease as he drives the music on whilst being sensitive to the chemistry happening between the two instruments, especially in the more reflective middle section where extended techniques such as (what sounds like) bowed cymbals are carefully applied to the soundscape. There is a great moment where Yoshihide’s guitar is feeding back whilst being processed through some effects resulting in harmonic sweeps, which sound like an air raid siren due to a similar sliding glissando of harmonic spectra. 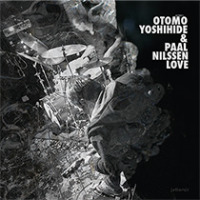 Although effectively a duo of electric guitar (Otomo Yoshihide) and drums (Paal Nilsson-Love), there is a real fullness to this album as both these instruments are exploited not only for their power but also for their introspective ability as well. While there is nothing new necessarily happening here it is an extremely enjoyable album of improvised music, which is performed with a natural expertise from these two musicians, and grows with you on each new listen as all good music usually does.